Lincolns Inn Fields / April. 11th. 1823. The Day Book entry for 11 April 1823 notes that George Bailey was About plans of the new Courts at Westminster. 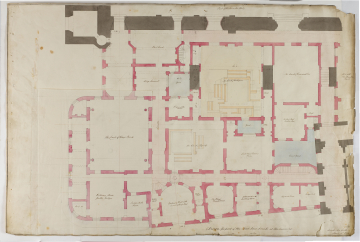 The Day Book entry for 11 April 1823 notes that Charles Papendiek was About plans of the new Courts at Westminster. 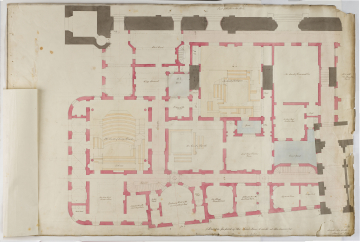 The flyer appears to show the arrangements of ancillary spaces at the upper (or gallery) level of the Court of King's Bench. The latter Court room has four columns in antis at its corners. The Court of Exchequer is shown with an eliptical opening over it. Digitisation of the Drawings Collection has been made possible through the generosity of the Leon Levy Foundation. This catalogue of Soane’s designs for the New Law Courts was generously funded by The Worshipful Company of Mercers and The Pilgrim Trust.